Patrick Crehan's series about Food and Agriculture - Part 2. We are happy to announce the Partnership with InsightBee - Members of the Club of Amsterdam get unique benefits! A new report from Ireland explains how technologies will transform food and agriculture between now and 2035: This article focuses on the role of robotics and the automation of physical tasks in enabling this transformation. See also Teagasc Technology Foresight 2035. The attention of the world has been recently been captured by the rapid progress being made in the development of the autonomous car. Almost all major car companies now have roadmaps for the introduction of autonomous cars, in a progressive fashion that has already started for many companies with driver assist and accidence avoidance features, and is intended to culminate in a not too distant future in cars that require no driver, and which take-over all tasks that required the intervention of licensed human beings. Google in particular has captured the imagination of the public with the introduction of its self driving car project started in 2009 and since then many others have followed. Most people are less aware that self-driving car concepts have a much longer history. One of the pioneers of this domain is John Deere the US based maker of tractors, mowers and farm machinery. John Deere is currently the largest operator in the world of autonomous vehicles and you can see one of its tractors in operation on YouTube. Others include ATC, the Autonomous Tractor Corporation. Vehicles such as these reduce the need for labour, or allow available labour to achieve higher levels of productivity. Note that no one is driving the tractor that is pulling the trailer taking the load of corn. Whereas John Deere and other companies like it target large farms others such as Kubota of Japan target the needs of small farmers, farms on rugged hillsides with irregularly shaped fields or water logged land. It is interesting to browse You Tube videos of Kubota machinery operating in the context of fields typical to places like Thailand. It gives an idea of how different is the challenge in these countries compared to the giant prairies of the American mid-west or the vast expanses of Poland. Kubota intends to embed as much intelligence into their small format relatively low cost machines, as is already to the big clients of John Deere. In this way, technology progress in Asia may provide a "frugal innovation" dividend for European producers. IBEX Automation of the UK has developed a robot for spraying weeds that can navigate and manoeuvre in difficult terrain and on marginal lands. The Lettuce Bot developed by Blue River Technology is designed to thin plants such as lettuce, keeping only those that are likely to provide the best product. Energid has developed an autonomous system for picking citrus fruit. Agrobot of Spain has developed an autonomous system for harvesting strawberries. Wageningen University in the Netherlands has developed an autonomous harvester for picking cucumbers. A team at Harvard University is currently working on an autonomous robotic bee capable of pollinating a field of crops. 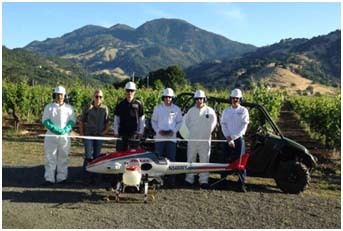 US based Vision Robotics has developed an autonomous system for removing weeds and pruning vines. Its French competitor Wall-Ye is capable of performing a range of tasks including pruning. Kubota proposes another approach to problems such as the pruning of vines. One that is increasingly well known in Asia, but almost unknown in Europe, the use of exoskeletons or wearable robots. Video testimonies from users of its Arm-1 exoskeleton on the website of the Kubota Cyber Farm Machinery Square illustrates how they are currently being used by a wide range of users including seniors who have to carry out physical work on a farm. This system is not intended for lifting heavy loads. It gives relief to workers who may lack physical strength and resilience such as the aged owners of farms in rural Japan. The testimonies indicate that "you really have to try it to understand the value it can provide." In Australia autonomous drones and four wheeled robots are being tested for herding cattle and sheep. Farmers in Ireland have been experimenting with this as well. A recent FT article describes how drones lift farming to a higher plane in Bulgaria. It is interesting to note that Japan has employed drones in agriculture, already for the last 3 decades. They are mainly used for spraying and it is estimated that 1 in 3 bowls of rice eaten in Japan have been treated at some stage by aerial drone. Yamaha is the main producer and it has only recently started to go over-seas in its sales efforts. In the US, it recently won an exemption from the FAA to a law banning commercial use of unmanned aerial drones. It intends to market them both in the US and the EU, for use in the production of rice and wine. For now these drone systems require human pilots, but future versions will operate autonomously without the need for adult supervision. As cars and tractors and other machinery act with greater degrees of autonomy, so will drones. 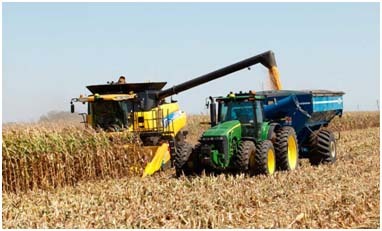 With the help of AI and machine learning technologies these systems will respond to problems in real time, based on direct commands, scheduled programs of operation or as part of bigger more complex systems that generate alerts from cameras and sensors dispersed throughout the fields and other places of production. 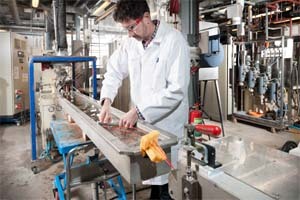 The Danish Meat Research Institute is working on the application of robotics in meat processing. It already claims superior results in the use of robotics to process pork. According to Food Quality News a Scottish abattoir has recently made a breakthrough in the use of robotics to measure the "eating quality" of meat. Scott of New Zealand is a world leader in the automation of work in abattoirs, in particular in the processing of sheep and lamb and in the execution of complex tasks such as the removal of meat from the bone. Its most recent You Tube video talks of how it aims to develop a system capable of processing a whole lamb carcass in under 12 seconds. Scott is not the only actor in this space and the technology is also applied to the processing of beef. To get an insight into what is being done in Australia it is worth having a look at this report on the Bordertown R+D project. Nowadays there are other ways of producing meat. Modern Meadows is a US based venture backed start-up that intends to revolutionise agriculture by growing animal cells in test-tubes with a view to producing both meat and leather. Perhaps this has the potential to make a "meat eater" out of the most ardent vegetarian. Rearing sheep is a very important commercial activity. They are reared not only for their meat and milk but also for their wool. They are sheared once a year. In some places, if they don't get sheared, they are at risk of dying from heatstroke. The job requires a lot of skill as can be seen from this short video of a sheep shearing competition. The fact of having to work with a squirming and often confused live animal results in small nicks to the sheep's skin. When these happen in the vicinity of an artery close to the surface of the skin, it occasionally results in the death of the sheep. The goal of "good shearing" is therefore to reduce trauma to the animal, maximize the yield of wool by shearing as close to the skin as possible, reduce damage to the skin from accidental cuts, and reduce the loss of live animals. Automation is not only as a way to increase productivity but also a hedge against a possible shortage of people who know how to do it well. Research in Australia was conducted on the application of robotics to shearing as early as about 1978. These efforts were successful in that they resulted in the development of a system that was demonstrably faster, better and safer for the animal. However the system was never adopted. It seems it raised many ethical and cultural issues, in particular in relation to the difficulty of ensuring "0" fatalities with the technology available at that time. The cow is trained to use the robot whenever it feels the urge. She has no need for assistance. Traditionally, one of the most labour intensive activities on a dairy farm has the milking of cows. The installation of a modern milking parlour is also among the biggest investments a dairy farmer will ever make. Nevertheless it remains a labour intensive activity and the ability of a farm to grow is often conditioned by the number of cows a single labourer is able to handle on their own. 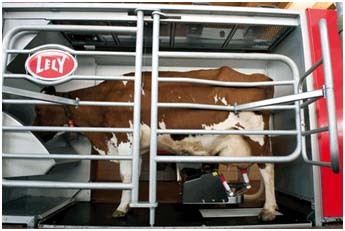 Research in the automation of milking has been going on for many decades and companies such as Lely, De Laval, Boumatic and Fullwood all provide commercial robotic milking systems. These systems make most sense however only for very large farms and so adoption of robotic solutions in milking has been limited by the relatively small size of farms. This is an area ripe for revolution based on new thinking that will bring the benefits of automation to the majority of farmers, for example to those with as few as 100 cows or even less. Maybe it is time for an open source hardware + open source software approach that will create opportunities for local providers competing on science and technology rather than on hardware. Moving away from the countryside and onto the subject of urban agriculture, it is interesting to note the adoption of robotics in the production of small green vegetables, lettuce, cucumbers tomatoes and small fruit such as strawberries. Sky Greens of Singapore claims to be the world's first commercial vertical farm. California based Urban Plot claims to be able to grow 16 acres worth of food in a 1/8 acre plot. A joint venture involving an indoor farming company called Mirai and GE of Japan has led to the development of systems that produce up to 10,000 heads of lettuce every day. They claim that lettuce grown in this way has eight-to-ten times more beta-carotene and twice the vitamin C, calcium and magnesium of competing products grown outdoors. 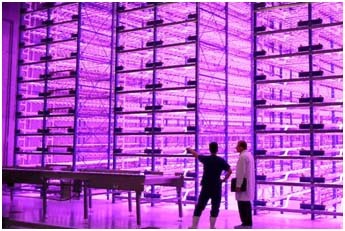 Although these systems employ human workers, a Japanese company called SPREAD has developed a fully automated indoor farming system entitled the Vegetable Factory. There are already more than 200 such systems in operation in Japan and in 2017 SPREAD will open its newest and largest facility near Kyoto, intended to produce 10 million heads of lettuce a year. These large scale indoor systems have been developing slowly over the last few decades arguably since the publication of Dixon Despommier visionary work on "The Vertical Farm." On a smaller scale but still outdoors FarmBot is a 100% open source robotic system suited to small scale local food production, suitable for small produces and people with vegetable patches in their garden. 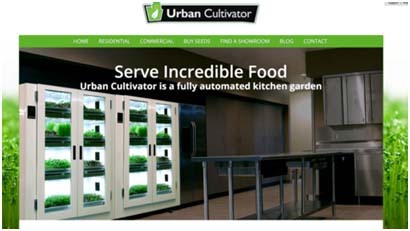 Targeting an even smaller scale grower we have companies like Urban Cultivator and Grove Ecosystem developing indoor garden concepts based on aquaponics and LED lighting that grows food indoor at home or at work to deliver fresh food all year round. Retail and logistics will also benefit from robotics and the automation of complex physical tasks. 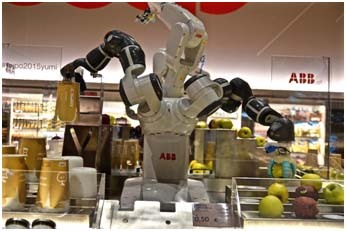 At the Future Food District of the 2015 Food Expo Milan, ABB demonstrated its versatile robotic arm capable of picking and packing fruit such as apples. Finally we come to the role of robotics in consumption both at restaurants and in the home. 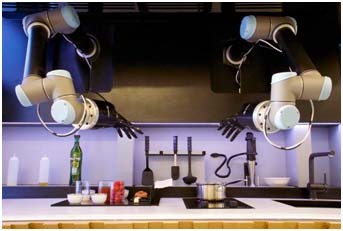 In 2009 a number of YouTube videos appeared demonstrating the future application of robotics in the kitchen. One of these called FuA Men (short for a "Fully Automated raMen") was a robotic noodle shop in Nagoya. It is not clear if this shop still exists, but it featured a robotic chef and its robotic assistant. They not only prepared ramen, but talked to customers and performed (rather bad) stand-up comedy. Another demonstration of that time involved a weirdly human looking robot hand that made sushi. Since then a group of MIT students has recently developed the Spyce Kitchen concept as the basis for a new style of fast food restaurant, and UK based Moley Robotics in collaboration with the Shadow Robot Company has developed a very impressive robotic kitchen that can emulate Michelin starred chefs and that has already learned by "observation" more than 2000 recipes. This opens up a whole new dimension in food related intellectual property, as well as a new pricing possibilities for the sale of food service systems. Moley intends to make it available commercially from 2017. We may be on the verge of a breakthrough where automation will enable in all parts of the agri-food supply chain. Autonomous tractors and the smart tools they deploy can help producers or farmers to achieve higher yields with lower inputs through greater accuracy and a greater ability to optimise aspects of production such as weather or time windows for optimal yield. Automation can help with produces of meat and dairy production, the production of cereals, fruit and vegetables. 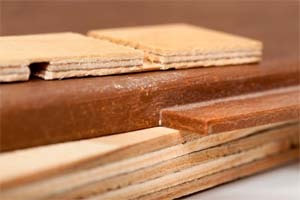 It can help in picking and packing as well as processing, distribution and retail. It is even pretty good in the kitchen. So much has already been achieved, in the automation of physically complex tasks right across the agri-food supply chain, as if by stealth. Although in many cases the potential of automation has been clearly demonstrated, uptake has been limited until now. For many of these systems issues of affordability, maintenance and reliability may need to be addressed. Perhaps a service oriented approach is the way forward based on new forms of ownership, uberisation or sharing and co-ownership. The coming decade should see waves of innovation not only in the transformation of work via new tools and systems, but in the transformation of business via new organisational and economic models. Research in agri-food related science and technology is going on all over the world. The two issues I want to highlight here are the role of innovation related competitions and the role of open source hardware and software, as well as the emergence of platforms to help accelerate development. 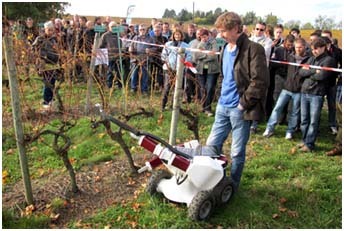 The FRE or Field Robot Event was founded by University of Wageningen in 2003. It appears to be the longest running such event in the world. The last one took place in Slovenia and the fourteenth such event will take place in Germany on 14-16 of June 2016. Nevertheless other parts of the world are starting their own independent initiatives. The US based ASABE agricultural robotics competition for example started in 2007. Even more recently the Ag Bot Challenge starts in 2016. It encourages teams to design, develop and demonstrate autonomous agricultural machinery that address specific on-farm challenges. The 2016 competition focused on planting seeds. In 2017 it will focus on weed and pest identification and removal. In 2018 the plan is to focus on autonomous harvesting. Earlier on we mentioned the FarmBot initiative aimed at growers that have access to small outdoor gardens. The MIT Open Ag Initiative is an "open source ecosystem of food technologies to create healthier, more engaging and more inventive food systems." 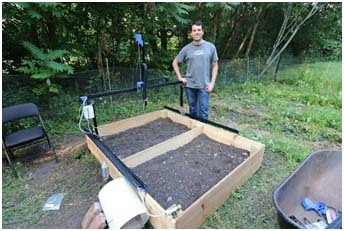 One of its platform projects is the development of a desk-top Food Computer that can be programmed to grow anything by simulating an approach climate, soil and nutrient conditions. FRoboMind is an open source robot control system that originated in Denmark. It was developed with a view to accelerating progress in the application of robotics in agriculture. It is currently employed in more than 10 field robot projects. It is easy to imagine future initiatives based on synergies between efforts such as these and those who participate in or are inspired by other open source movements such as Hong Kong based OSVehicle which has developed an Open Source platform for electric vehicles, and US based Local Motors which claims to produce the world's first 3D printed commercial automobile. In this article we focused on the role of robotics and the automation of physical tasks in enabling a transformation of global agri-food systems. In the next one we will discuss the role of ICT, sensor networks and big data in the automation of cognitive tasks and the work of management. Take a successful model with a technological bent and plenty of imagination and clothing starts to come alive. From caring for and helping to guide its wearer to serving as an additional form of expression (through embedded lighting, for example) to reshaping itself on demand, the future of fashion technology is rich with possibilities. 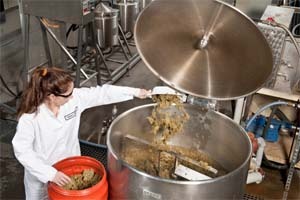 The Biobased Products Innovation Plant is the breeding ground for successful biobased products such as starch plastics from potato skins and Biofoam from PLA. 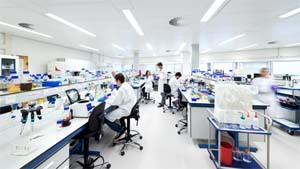 Join us on a tour of this impressing research facility  part of Wageningen UR Food & Biobased Research  in which applied research for companies has been conducted for more than three decades. 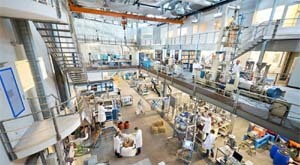 The Biobased Products Innovation Plant is located in Axis, the same building on Wageningen Campus that accommodates the applied research institute Food & Biobased Research. Two doors down from the reception we suddenly find ourselves in the impressive R&D facility, which feels and sounds like a real factory. 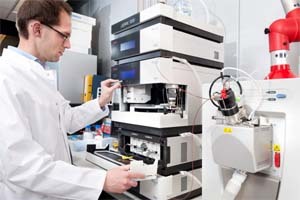 Here you have to speak-up to make yourself heard over all the decibels produced by the equipment, while scientists and technicians, wearing labcoats and safety goggles, are carefully monitoring the various processes. This is where smart ideas for the production of commercially viable products from biomass are tested: from laboratory to pilot scale. 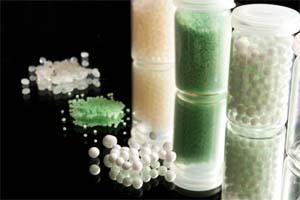 Although the production of biobased products such as bioplastics is only a fraction of the production of petrochemical products, its growth is impressive. Moreover, says Paulien Harmsen, scientist at Food & Biobased Research, developments are proceeding accordingly. Harmsen shows us the section of the hall where the fresh biomass arrives, ranging from crops like roadside (switch)grass, miscanthus and wheat straw to agricultural residual products such as sugar beet pulp and palm oil residues. 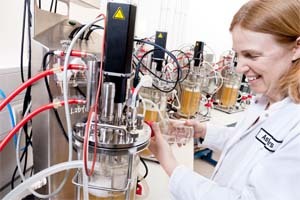 However, also more exotic biomass sources such as seaweed are examined on valuable components. InsightBee is the simple way to source high quality custom research and analytics from any device. From proactive alerts to tailored reports, InsightBees online platform delivers the intelligence you need every day  across all business functions and industries. With its pay-as-you-go model, ordering tailored insights is easier than ever. InsightBee is enabled by Evalueserve, an existing partner of Club of Amsterdam (CoA). Evalueserve is a global professional services provider with a 3,200+ strong global team, offering research, analytics, and data management services. Powered by mind+machine  Evalueserves unique combination of human expertise and best-in-class technologies that use smart algorithms to simplify key tasks. Note: One can use only one promotional code/discount option at a time while placing a request with InsightBee. Click here to learn more about InsightBee and how to place an order. Business research was never this easy! Contact Daniel Wald at wald.daniel@insightbee.com in case of any questions or if you need any assistance. Europe has begun to emerge from the prolonged slump caused by the global financial crisis in 2008 and exacerbated by the euro zone single-currency crisis in 20102011. In 20142015, aggregate employment levels rose faster than at any time since 2008: over four million new jobs were created in the EU28. This, the fifth annual European Jobs Monitor report, looks at 2011 Q22015 Q2 employment shifts at Member State and aggregate EU level. A jobs-based approach is used to describe employment shifts quantitatively (how many jobs were created or destroyed) and qualitatively (what kinds of jobs). It also introduces a new set of indicators on the task content, methods and tools used at work. Derived from international databases on work and occupations, these indicators give a detailed account of what Europeans do at work and how they do it. They also provide valuable new insights on the structural differences and recent evolution of European labour markets, as well as a better understanding of labour input in the production process and the changing nature of skills required. Africa is at a tipping point in 2016. Despite all the success the continent has achieved in recent years, new and old dangers - economic, political, and security-related - threaten to derail its progress. With sound policymaking, effective leadership, and enough foresight, however - Africa can meet and defeat these challenges as well as the many more to come. In this year's Foresight Africa, the Africa Growth Initiative and its colleagues discuss six overarching themes that place Africa at this tipping point and give their view on what they perceive to be key areas for intervention to keep Africa on its current rising trajectory. This year's format is different from years past, encompassing viewpoints from high-level policymakers, academics, and practitioners, as well as utilizing visuals to better illustrate the paths behind and now in front of Africa. .Why Is Arctic Methane An Emergency? Latest research finds the Arctic is already a substantial source of methane to the atmosphere: 50 million metric tons of methane is released per year from theEast Siberian Arctric shelf alone. 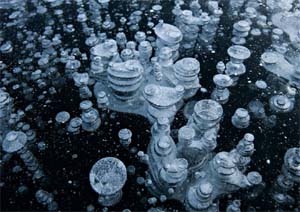 There are three huge reservoirs of Arctic methane till recently safely controlled by the Arctic freezing cold environment. They are now all releasing additional methane to the atmosphere as the Arctic rapidly warms (carbon feedback). The more the temperature increases and the longer the Arctic warms the more methane these sources will emit. That much is certain. methane hydrate. This is frozen solid methane gas under pressure in sea floor sediments. The largest source of Arctic methane hydrate is the East Siberian Arctic shelf (ESAS) , the largest continental shelf in the world. Methane is now venting to the atmosphere from under the shelf. All the evidence indicates that an abrupt massive release of methane gas from Arctic hydrates could happen which most likely would be catastrophe to the global climate and our planet. worlds soils. They naturally emit some methane but as they warm they put out more methane. They can respond rapidly to a jump in Arctic warming putting out much more methane. The third huge methane source is the vast regions of permafrost. As the world warms the permafrost is thawing and is emitting methane. Permafrost cant respond very rapidly to a jump in warming but its thawing at some point becomes irreversible. These different methane sources will combine to accelerate the rate of methane emission from each one and to accelerate the rate of Arctic warming. It is certain if the Arctic is not cooled these Arctic methane sources will greatly increase with global warming and that will greatly increase the rate of global warming. Unstoppable runaway Arctic warming will lead to unstoppable runaway global warming. To prevent runaway Arctic warming the Arctic must be cooled. Arctic contains several times the amount of carbon in the atmosphere. Most is potentially methane. The review finds many Arctic changes that will result from global warming will increase the emission of Arctic methane. The East Siberian Arctic Shelf holds over 90% of Arctic methane hydrate, which is estimated by N Shakhova at double atmospheric carbon. The subArctic Boreal forest is the largest forest store of carbon, even more than the Amazon. Boreal forest fires emit mainly CO2 but some CH4 is also emitted. 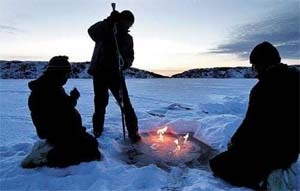 In forested regions over permafrost the fire thaws surface permafrost and more methane is released. The Arctic summer sea ice is in a rapid, extremely dangerous meltdown process. The Arctic summer ice albedo loss feedback (i.e., open sea absorbs more heat than ice, which reflects much of it) passed its tipping point in 2007  many decades earlier than models projected, and scientists now agree the Arctic will be ice free during the summer by 2030. However, that is not to say it couldn't happen very much earlier. At the Fall Meeting of the American Geophysical Union in San Francisco from 5-9 December 2011, there was a session on Arctic Gas Hydrate Methane Release and Climate Change at which Dr. Igor Semiletov of the Far Eastern branch of the Russian Academy of Sciences reported dramatic and unprecedented plumes of methane  a greenhouse gas that is over 70 times more potent than carbon dioxide for 20 years after emission  were seen bubbling to the surface of the Arctic Ocean by scientists undertaking an extensive survey of the region. This has been reported by UK's Independent newspaper and copied by news agencies around the world and in a number of online blogs. If methane release from Arctic sea floor hydrates happens on a large scale  and this year's reports suggest that it will  then this situation can start an uncontrollable sequence of events that would make world agriculture and civilization unsustainable. It is a responsible alarm, not alarmist, to say that it is a real threat to the survival of humanity and most life on Earth. "Methane gas released from the Arctic seabed during the summer months leads to an increased methane concentration in the ocean. But surprisingly, very little of the climate gas rising up through the sea reaches the atmosphere." There is still a lot we do not know about seasonal variations. The methane can also be transported by water masses, or dissolve and be eaten by bacteria in the ocean. Thus long term observations are necessary to understand the emissions throughout the year. The only way to obtain these measurements are to use observatories that remain on the seabed for a long time, says Benedicte Ferré. 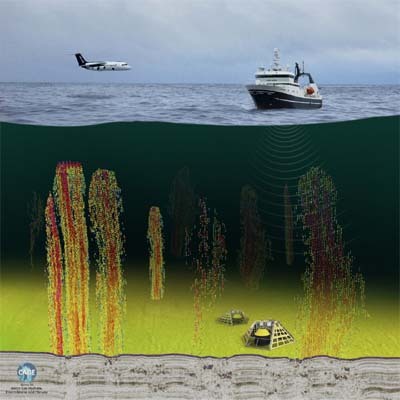 Ocean floor observatories, research ship and airplane were deployed to a area of 250 active methane gas flares in the Arctic Ocean. Illustration: Torger Grytå. Leading innovation expert Alec Ross explains whats next for the world: the advances and stumbling blocks that will emerge in the next ten years, and how we can navigate them. In each of these realms, Ross addresses the toughest questions: How will we adapt to the changing nature of work? Is the prospect of cyberwar sparking the next arms race? How can the worlds rising nations hope to match Silicon Valley in creating their own innovation hotspots? And what can todays parents do to prepare their children for tomorrow? Ross blends storytelling and economic analysis to give a vivid and informed perspective on how sweeping global trends are affecting the ways we live. Incorporating the insights of leaders ranging from tech moguls to defense experts, The Industries of the Future takes the intimidating, complex topics that many of us know to be important and boils them down into clear, plainspoken language. This is an essential book for understanding how the world works - now and tomorrow - and a must-read for businesspeople in every sector, from every country. Mr. Cordeiro studied at the Massachusetts Institute of Technology (MIT) in Cambridge, USA, where he received his Bachelor of Science (B.Sc.) and Master of Science (M.Sc.) degrees in Mechanical Engineering, with a minor in Economics and Languages. His thesis consisted of a dynamic modeling for NASAs Freedom Space Station (the International Space Station of today). He later studied International Economics and Comparative Politics at Georgetown University in Washington, USA, and then obtained his Masters of Business Administration (MBA) at the Institut Européen dAdministration des Affaires (INSEAD) in Fontainebleau, France, where he majored in Finance and Globalization. During his studies, Mr. Cordeiro worked with the United Nations Industrial Development Organization (UNIDO) in Vienna, Austria, and with the Center for Strategic and International Studies (CSIS) in Washington, DC, USA. He started his doctoral degree at MIT, which he continued later in Tokyo, Japan, and finally received his PhD at Universidad Simón Bolívar (USB) in Caracas, Venezuela. He is a lifetime member of the Sigma Xi (Scientific Research) and Tau Beta Pi (Engineering) Honor Societies in North America, is also a honorary member of the Venezuelan Engineers College (CIV), and his name has been included in the Marquis Edition of Whos Who in the World. At present, he is chair of the Venezuelan Node of the Millennium Project, Visiting Research Fellow at the Institute of Developing Economies (IDE  JETRO) in Tokyo, Japan, and Founding Faculty and Energy Advisor at Singularity University (SU) in NASA Ames Research Park, Silicon Valley, California, USA. He is also an independent consultant, writer, researcher, professor and tireless traveler. He has lectured as an Invited Professor at several major institutions, from MIT in the USA and Sophia University in Japan to the Institute for Higher Studies in Administration (IESA) and the Central University of Venezuela (UCV), where he created the first formal courses of Futures Studies (Prospectiva) and the Austrian School of Economics in Venezuela. 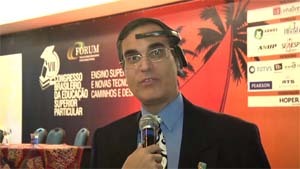 Mr. Cordeiro is founder and president emeritus of the World Future Society Venezuela Chapter (Sociedad Mundial del Futuro Venezuela); director of the Single Global Currency Association (SGCA) and the Lifeboat Foundation; cofounder of the Venezuelan Transhumanist Association and of the Internet Society (ISOC, Venezuela Chapter); board advisor to the Brain Preservation Foundation (BPF) and Center for Responsible Nanotechnology (CRN); member of the Academic Committee of the Center for the Dissemination of Economic Knowledge (CEDICE), the Foresight Education and Research Network (FERN), the World Future Society (WFS) and the World Futures Studies Federation (WFSF); expert member of the TechCast Project and ShapingTomorrow; former director of the World Transhumanist Association (WTA, now Humanity+), the Extropy Institute (ExI), the Club of Rome (Venezuela Chapter, where he was active promoting classical liberal ideas and the idea of World Opportunitique beyond World Problematique and World Resolutique) and of the Association of Venezuelan Exporters (AVEX), where he participated in the original negotiations of the Free Trade Area of the Americas (FTAA). He has also been advisor to the Venezuelan Business Association (AVE) and other companies and international organizations.